While this system is easy to use and even easier to learn, is it worth the money for beginners? An easy-to-use magnet-based primary module concept and quick disconnect for secondary modules, with a lot of capabilities included in the kit. No ability to add Wi-Fi after purchase, and a number of viable radio options missing. A small but prominent issue with module connectors. 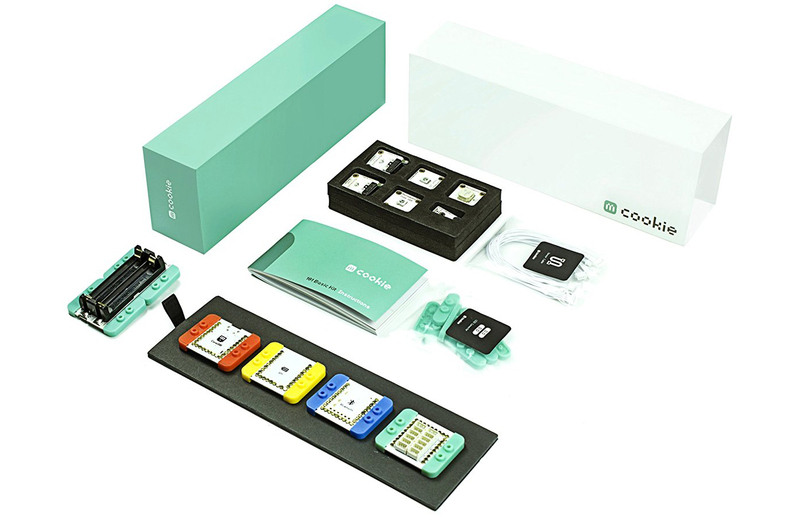 If you are looking for a kit for education or simple circuit prototyping, this system is a great idea that is worth serious consideration. The absolute best part of this system is the snap-together nature of the modules. Being able to literally snap on a Bluetooth or Wi-Fi module to add that capability makes the Arduino platform far more reachable for younger makers than jumper wires and breadboards. Second, and only by a little, is the lack of hard wiring for simpler things, like mics, speakers, LEDs and such. By removing the more menial aspects of circuit building, you can focus more on learning about the way the parts of the circuit interact and how to control them via software. A full Arduino might be more versatile, but the mCookie is a great way to learn one part of circuitry at a time. In addition, the modules are all designed to work with LEGOs, so you can even build simple robotics projects with your existing LEGO collection. The Basic kit comes with a CoreUSB and Bluetooth communication module, making connectivity easy, but not universal. The Expert Kit adds a Wi-Fi module, which is currently unavailable as an individual purchase. While this covers the standard case, unfortunately, there are a number of other communication protocols that are currently missing. For example, adding long-range communication with ZigBee, IoT communication with Z-Wave or Insteon, or even cellular connectivity with GSM or LTE, would all be great capabilities. Fortunately, because of the nature of the product, Microduino or another manufacturer could build a compatible module to add these protocols in the future. Unlike traditional Arduino implementations, this product requires no major wiring to accomplish the majority of tasks. From the base device, you can easily add complex capabilities like Bluetooth communication, or simple things, like LEDs and sensors. Major modules connect via pogo pins and magnetics, while smaller pieces connect via snap-in cables. As far as the development environment, or IDE, the interface is not extremely difficult, nor is it entirely intuitive. While setting up the program, we did encounter a small issue that prevented us from deploying the software to the device, though the manual did have a step-by-step guide to configuring for deployment; we simply missed it. Once we worked through that particular issue, development and deployment became far easier. Ideally, though, I would prefer to develop and deploy using something more standard, like Visual Studio. The build of the main modules is beyond sturdy. Being as little needs to be done to make them work together, it would be difficult to do something to damage them, other than scratching the circuits themselves. As for the smaller modules and their removable cables, some of them can be a little tight. While disconnecting an LED module, the connector got stuck in the board and pulling on it felt like it was going to break the wires, leaving the connector behind. Once the connector was removed, however, subsequent connections were far easier to remove from the same LED module. We also didn't experience this issue on all of the modules; it was sporadic. The development environment is compatible with both Windows and macOS, as are the drivers that power the mCookie on the computer. This means that just about any computer you have will likely be capable of programming the Core. Adding the LEGO option means that you can also build simple or complex cases and robotics setups with any LEGO pieces. Where this platform currently lacks is in the extensibility of modules. There are radio modules that would make more complex circuits possible that are currently not available. These radios are available through more traditional Arduino boards, however. It would also be nice to have a module that allows you to use existing Arduino shields, essentially as build-your-own module. While the Learning Curve is not steep, the usability might be, depending on your needs. As a learning tool, or even as a basic circuit prototype system, it is just fine. If your intentions are to use this in the place of a full Arduino board, however, you might find yourself wanting. Missing Connectivity options, a slightly clumsy Arduino IDE and small Build Quality issues could make the mCookie harder to use, or impossible to build certain types of projects.